Poliomyelitis (polio) is a serious illness that is caused by a virus. The virus can be spread through contact with an infected person. This is most often done through bacteria from their stool or oral discharge. The virus also can live on infected surfaces or in food and drink. Polio can cause paralysis (when you can’t move your arms and legs) or even death. Before the 1950s, thousands of children got polio each year. Fortunately, the use of the polio vaccine has made the disease very rare in most parts of the world. Today, you can keep your children from getting polio by making sure they get the vaccine. The purpose of a vaccine is to prevent you from getting a specific disease. The polio vaccine is called the inactivated poliovirus (IPV). It is given by injection (shot). First dose when they are 2 months old. Second dose when they are 4 months old. Third dose when they are 6 to 18 months old. Last dose (booster) when they are 4 to 6 years old. Vaccines carry a low risk of harm, but side effects can occur. Your child may have some pain or redness at the site of the shot. A severe allergic reaction is rare. The polio vaccine does not cause polio. For best results, make sure your child gets all 4 doses. Your child should not get the polio vaccine if they are allergic to some medicines. These include neomycin, streptomycin, and polymyxin B. They also should not get it if they are sick. Tell your doctor about any illness and get the shot when your child is feeling better. Talk to your doctor if you or your child is traveling to a place with polio. They may suggest an advanced vaccine schedule or booster shot. Tell the doctor when (day and time) your child received the vaccine. You also should file a Vaccine Adverse Event Report form with the Centers for Disease Control and Prevention (CDC). Ask the doctor to do this, or you can call 800-822-7967. Why does my child need the polio vaccine? 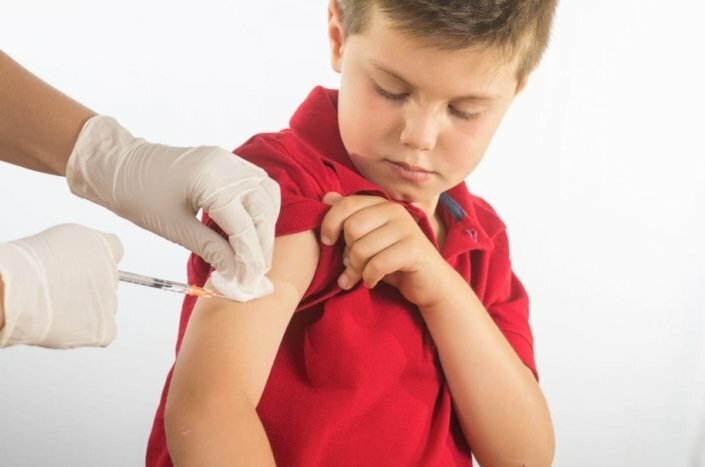 What could happen if I don’t get my child vaccinated? When should I schedule each dose of the polio vaccine? Do adults need to get the polio vaccine? Find immunization schedules for adults and children.